WIN! E45 Pamper Hamper Up For Grabs! Now that the turkey's been eaten and the presents unwrapped I thought we might all need a little something to cheer us up this St Stephen's Day (that's what we call Boxing Day in this part of the world!). The run up to Christmas can be stressful and between that, the wind and the cold weather, our skin can look and feel less healthy. 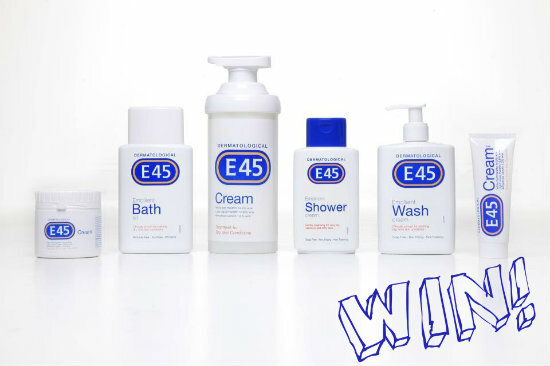 That’s why E45 launched their Emollient Therapy range, with gentle but effective products that are clinically proven to treat and soothe dry, itching, flaking, chapped and rough skin. Products include a new intense moisturiser, emollient bath oil, emollient shower gel and emollient wash.
E45 is an iconic brand, built on a foundation of trust with over 50 years’ experience working with leading dermatologists - and I have a fabulous hamper packed with all of these goodies to give away to one lucky reader – along with a luxury bathrobe. This is open to readers resident in the Republic of Ireland - just pop your details below to be in to win! I just finished doing all the sihes from Christmas, and my hands are in bits! Emollient sounds soooo good right now. My back is so dry & itchy that I'm in desperate need of something! I would love to win this , as my daughter suffers with skin problems and it is very expensive to keep buying these products for her, but as they do help, i will keep buying. Cool Prize! E45 is great for my skin. i love E45! It doesnt flare up my eczema! Great prize. My Mum has always swore by E45 and passed it on to me. E45 is my favourite skin product! I could really do with this! Always good to have some E45 in the house. As it seems like one zillion days until pay day, I could really do with a post-Christmas financial meltdown treat. A beautiful gift from a beautiful woman;) Thank you! ..